Kate is from Holywood, County Down and is a staff worker for the Alliance Party. She was a regular cyclist when living in London, but since moving back to work in Belfast she finds the road environment here too dangerous, and will rarely cycle the city.. I first learned to ride when I was 5 🙂 but I’ve been cycling properly since about 2008. I own a fixed-gear road bike which my sister and her boyfriend built for me. Cycling is popular within the family, my brother does the occasional lycra-hill thing, but I don’t know how regular that is! 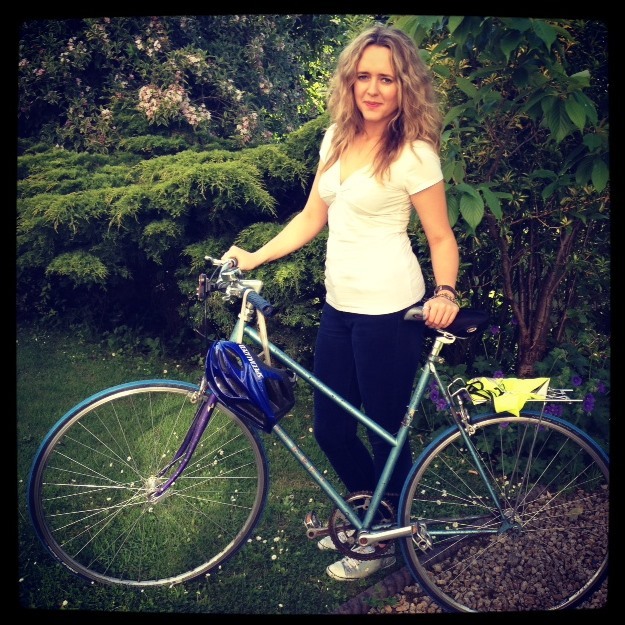 My sister is the real cyclist in the family, she even had her own bike building company in East London at one point. I love the freedom of cycling, I like that it’s environmentally friendly, that it’s cheaper and that it has so many health benefits. When I lived in London I had very little time to fit exercise into my day, so cycling from A to B kept me fit. Not only was it generally faster than getting the tube or the bus – it saved me about £100 a month on my oyster card. London is a cycling city though and I’m afraid Belfast really isn’t there yet. I’m terrified of cycling in Belfast! If I do use my bike (which is rare now) I tend to go out really early in the morning to avoid the traffic. Last year a close friend of mine was hit by a car when cycling and he was in a coma for two weeks – we were lucky he recovered so well. That incident shook me a bit and has definitely made me reluctant to cycle regularly. I also think drivers here aren’t particularly sympathetic towards cyclists – but that’s maybe because they’re not overly used to them being on the road. More cycle paths are important, but for Belfast to really embrace cycling I think there’s a general wariness from drivers and cyclists that needs to be addressed. I’d like to see a lot of what Transport For London (TFL) does for cycling being implemented here. I’d like to see local councils running bike clinics for cyclists like myself who are keen to use their bikes more – but lack the confidence. I genuinely think more people would get out on the roads if they felt they could cycle safely. In addition to that TFL also produces free ‘cycle friendly’ maps which colour codes best routes to take for different levels of cyclists. I think it’s great that Chris Lyttle MLA has started an All Party Group on Cycling at the Northern Ireland Assembly – cross-party political will seems to be there and I’m keen to see what they can achieve. Making the roads more cycle friendly is important – as is encouraging drivers to be more tolerant, but at the end of the day in order to justify the necessary changes more people need to be cycling – so the approach needs to be holistic. I really think the best place to start with is safety.